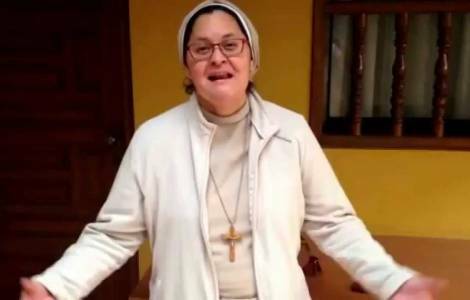 AMERICA/NICARAGUA - Sister Xiskya Valladares to the international community: "Please, act quickly, before they kill us all"
Managua (Agenzia Fides) - "I am just a Catholic nun. Nobody has asked me to write to you. But (...) I cannot stand and watch like a dictator massacre his people while you remain silent". This is how the open letter that Sister Xiskya Valladares, a Nicaraguan religious resident in Spain, published Sunday on her blog and on social networks begins, tagging various heads of state and government. "We are a small population of only 6 million inhabitants, which has no oil and is not important for your interests" continues the religious, "but we are talking about human beings with profound values, with great courage, in a strategic place in Central America. They deserve your help". Then she lists some of the major cruelties committed by the regime of Daniel Ortega. Those who publish comments or news against the government are at risk of seizure and disappearance, as reliable sources confirm to Fides. The letter continues: "They have burned alive families with children, shot citizens who marched peacefully in the streets, fired at children, committed sacrileges in churches, wounded a bishop, arrested many people without judicial orders, tortured them. The elderly, women, children, men: no one is saved today in Nicaragua. They are full-scale human rights crimes. When will you react?". The nun then asks rulers to leave aside "at least for once, political and economic interests" and to show their humanity. "It is not a question of ideology, religion or politics. It is a question of humanity","you have been elected to make the world more human", "the people of Nicaragua need you now. Please, act. Do it soon, before they kill us all".